I have grown a little obsession with all things fawn print since I saw this beautiful AW13 Carven skirt, and since, Givenchy Bambi sweater. 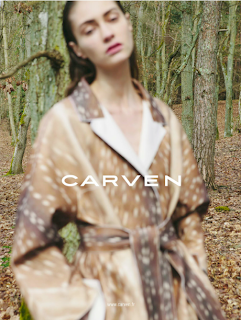 The Carven print comes in two skirt designs, several tops and a coat and I want every single one. I'm on the look out for anything fawn print in the weeks to come and may have to invest in a Bambi sweater... i've seen quite a few floating around on the internet! ah, it's such a unique fur print to what you usually see, I love it!